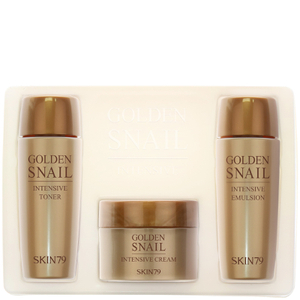 Treat your complexion to the Golden Snail Intensive Miniature Set from Korean skincare brand Skin79. The collection combines a luxurious toner, rich cream and anti-ageing emulsion enriched with the regenerative qualities of Golden Snail filtrate. Harnessing the powers of Golden Snail and Bird Nest Extracts, the anti-ageing formula delivers intense moisture and hydration, whilst helping to minimise the appearance of wrinkles. Expect a smooth, refined and rebalanced complexion that is prepared for the next step in your skincare regime. Balancing a refined blend of rare plant extracts and essential nutrients, the rich cream harnesses the restorative powers of Golden Snail in an advanced Multi-Complex, helping to optimise moisture levels and stimulate natural elastin production for a plumping effect. Fortified with Niacinamide (Vitamin B) and Adenosine, a yeast-derived extract, skin feels softened and nourished with the look of fine lines visibly reduced. Helping to slow down the ageing process whilst deeply moisturising, the brightening formula utilises seven patented active ingredients to replenish nutrients and moisture back into dry skin. Its dose of Red Korean Ginseng restores vitality, 24K Gold performs an anti-wrinkle effect, and Golden Snail filtrate regenerates, relieves and rejuvenates to leave the complexion smooth and radiant. Expect, brighter, younger, supple-looking skin. Toner: Water, Snail Secretion Filtrate (300,00 Ppm)Glycerin, Niacinamide, Peg/Ppg-17/6 Copolymer, Pentylene Glycol, Saccharum Officinarum (Sugarcane) Extract, Chondrus Crispus Extract, Aloe Ferox Leaf Extract, Panax Ginseng Root Extract, Viscum Album (Mistletoe) Fruit Extract, Gold (Ci 77480), Swiftlet Nest Extract, Gardenia Tahitensis Flower Extract, Origanum Vulgare Leaf Extract, Salix Alba (Willow) Bark Extract, Chamaecyparis Obtusa Leaf Extract, Portulaca Oleracea Extract, Scutellaria Baicalensis Root Extract, Lactobacillus/Soybean Ferment Extract, Cinnamomum Cassia Bark Extract, Discorea Japonica Root Extract, Dipropylene Glycol, Peg-60 Hydrogenated Castor Oil, Tromethamine,Octyldodeceth-16, Sodium Chondroitin Sulfate (995ppm), Adenosine, Sodium Hyaluronate, Sodium Polyacrylate, Biosaccharide Gum-1, Polydecene, Butylene Glycol, Squalane, Ethyl Hexanediol, 1, 2-Hexanediol, Carbomer, Disodium Edta, Phenoxyethanol, Fragrance (Parfum). Cream: Snail Secretion Filtrate (508,912 Ppm), Water, Phenyl Trimethicone, Glycerin, Niacinamide, Dimethicone, Cyclopentasiloxane, Squalane, Cetearyl Alcohol, Jojoba Esters, Dipropylene Glycol, Pentylene Glycol, Macadamia Ternifolia Seed Oil, Viscum Album (Mistletoe) Fruit Extract, Aloe Ferox Leaf Extract, Panax Ginseng Root Extract, Swiftlet Nest Extract, Gold (Ci 77480), Dioscorea Japonica Root Extract, Gardenia Tahitensis Flower Extract, Origanum Vulgare Leaf Extract, Salix Alba (Willow) Bark Extract, Chamaecyparis Obtusa Leaf Extract, Portulaca Oleracea Extract, Scutellaria Baicalensis Root Extract, Lactobacilus/Soybean Ferment Extract, Cinnamomum Cassia Bark Extract, Glycereth-26, Hydrogenated Polyisobutene, Cetearyl Olivate, Sorbitan Olivate, Polysorbate 60, Glyceryl Stearate, Peg-100 Stearate, Caprylyl Glycol, Tromethamine, Cetearyl Glucoside, Sodium Polyacrylate, Ethylhexyl Stearate, Sodium Chondroitin Sulfate (995ppm), Polydecene, Adenosine, Trideceth-6, Ceramide 3, Phytosphingosine, Tocopherol, Butylene Glycol, Ethyl Hexanediol, 1, 2-Hexanediol, Ethlhexylglycerin, Carbomer, Disodium Edta, Phenoxyethanol, Fragrance (Parfum), Caramel, Yellow 5(Ci 19140),Yellow (Ci 15985). Emulsion: Water Snail Secretion Filtrate (301.400 Ppm), Glycerin, Cydopentasiloxane, Hydrogenated Poly (6-14 Olefin), Butylene Glycol, Niacinamide, Decyl Cocoate, Cetyl Ethythexanoate, Pentylene Glycol, Integrifolia Macadamia Seed Oil, Macadamia Seed Oil Ternifolia, Swiftlet Nest Extract Aloe Ferox Leaf Extract, Panax Ginseng Root Extract, Viscum Album (Mistletoe) Fruit Extract, Gardenia Tahitensis Flower Extract, Origanum Vulgare Leaf Extract, Salix Alba (Willow) Bark Extract, Chamaecyparis Obtuse Leaf Extract, Portulaca Oleracea Extract, Scutellaria Baicalensts Root Extract , Lactobacillus / Soybean Ferment Extract, Cinnamomum Cassia Bark Extract, Dioscorea Japonica Root Extract, Gold (Cl 77480), Ethylhexyl Palmitate, Polysorbate 60, DIPROPYLENE Glycol, Sorbitan Olivate, Cetyl Palmitate, Sorbitan Palmitate, Dimethicone, Raffinose, Caprylyl Glycol, Chdndroitin Sodium Sulfate (995ppm) "Acrylates / C 10-30 Alkyl Acrylate Crosspolymer, Tromethamine, Sodium Acrylate / Sodium Acryloyldimethyl Taurate Copolymer, Adenosine, Isohexadecane, Polysorbate 80, Polydecene, Sorbitan Oleate, Squalane, Ceramide 3, Phytosphingosine, Ethyl Hexanediol, Ethylhexylglycerin 1,2-Hexanediol, Behenyl Alcohol, Cetearyl Alcohol, Xanthan Gum, Disodium EDTA, Phenoxyethanol, Fragrance (Parfum).